This Whole Grain Cranberry Mustard is simple to make, uses up leftover cranberry sauce, and tastes amazing on your leftover turkey sandwiches. Or any sandwich for that matter! And so #CranberryWeek continues! Have you been following all the delicious recipes these amazing bloggers have put together for this event? You really should! Those pork recipes yesterday looked amazing! And the cornbread both sweet and savory version are truly going on the menu. And that’s precisely what I did! 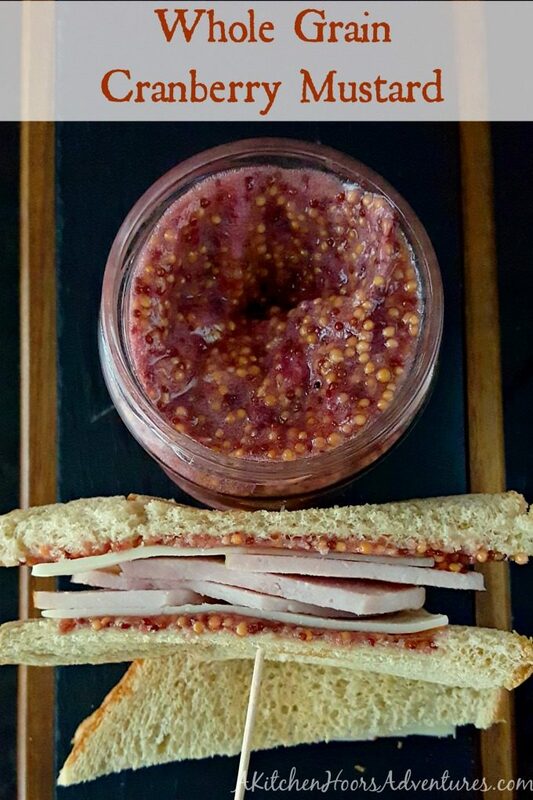 I took leftover cranberry sauce (or relish) and added it to some yellow and brown mustard seeds for a delicious homemade, whole grain, mustard. Not only is it delicious, but its super simple to make. I kid you not! Now, I’ve made mustard before. Granted I haven’t opened that jar in a while, but I’ve made mustard before. It’s not very difficult. You simply marinate some seeds in some vinegar and process. Voila! You’ve made mustard. The other mustard I made I haven’t really shared, yet. I’m not sure why not. I just haven’t. It was one of my stranger ideas that I had. I call it margarita mustard. I marinated these seeds in some tequila. No, you don’t always have to use vinegar. You can marinate them in other liquids, too. I was thinking maybe bourbon at some point? But then the hubs would fuss because we have all these jars of mustard and we don’t eat them often. He’s a Dijon person. However, I had this large jar of apple shrub in the refrigerator and thought that would make the perfect base for this cranberry mustard. I know, it’s an apple shrub, but the flavors and spices in there really compliment the cranberry sauce (or relish). See how delicious this mustard looks? All that cranberry color, those mustard seeds simply packed with delicious flavors. This is the perfect mustard for your leftover turkey sandwiches. Heck, I even BOUGHT turkey lunch meat just so I could put this mustard on a turkey sandwich. I’m not kidding. Just a word of caution. When you first taste the mustard it might seem a little spicy or pungent to you. I thought the same thing. However, after allowing it to rest in the refrigerator at least 24 hours before using, the flavor of the seeds mellowed out and blended in with the sweet of the cranberries. Trust me on this one. It turned into a deliciously sweet mustard with a nice little whole grain kick to it. Have you ever made your own mustard? Are you like my hubs and a Dijon or yellow only person? Place the mustard seeds and shrub (or vinegar) in a jar. Shake the jar to blend the vinegar with the seeds. Allow to sit for 24 hours in a dark place. Strain the seeds, reserving the leftover vinegar, and place in a food processor. Process the seeds adding some of the vinegar to make sure the mixture is smooth. Add the cranberry sauce, a little a time, until you reach your desired consistency and flavor. I would love this mustard on ALL of my sandwiches! Thank you! I agree. I put it on a sandwich just last week. Thank you! The shrub was nice and sweet, the mustard was spicy, and the cranberries brought the tang. It’s a delicious mustard! I hope you try it. What a great way to use some cranberry sauce – bet it’s tasty! That’s always my goal, use up the cranberry sauce that doesn’t get eaten. It is delicious. I may actually EAT this mustard! I want to spread this on everything!! This mustard looks delicious! I can imagine a number of ways to use this in recipes. Thank you! It is. I can’t wait to use it with my turkey, dip pretzels in it, make a pan sauce with it. So many choices.